Weston is a large popular seaside resort, with a superb coastline, accessible wide sandy beaches, and lots of traditional seaside attractions. The seafront area has recently been upgraded with a magnificent rebuilt pier and newly refurbished sweeping promenade, with views over the Bristol channel to Steep Holm and Flat Holme islands. Ideal for a leisurely stroll or an evening jog, but if you're not feeling that energetic you can simply enjoy a land train ride along its full length. There's bucket-loads of fun to be had along the sea front, with fun beach activities, donkey rides, fun-fair rides and many other traditional amusements. Weston's wide golden sands are perfect for ball games, sun-bathing and building sand castles. There have been donkey rides on the beach here for nearly 200 years and they are still ferrying excited children along the shoreline today. Weston has a pleasant town centre with a vibrant high street and popular undercover shopping centre with a good variety of shops, restaurants, cafes and bars. You will also find plenty of the usual seaside novelty shops and souvenir parlors on the seafront. Further along the promenade there are a variety of beach hut bistros selling fast food, ice creams and fresh seafood. The best fish and chips in Somerset can be found at Papa's along the Boulevard. This award winning restaurant regularly has long queues outside of it's doors. If you grow tired of the beach there are scores of other attractions in and around the town to enjoy, including a Water Adventure Play Park, ten pin bowling, outdoor bowling greens, a Sea Aquarium, land trains, boat trips and many assorted amusement rides along the seafront and the pier. For those seeking more peaceful activities there is a fascinating town museum, a pleasant park, Italianate Winter Gardens, woodland walks and several nature reserves to explore. To the south is Uphill nature reserve and to the north is the old Town Quarry nature reserve. Further to the north is the 300 acre Weston Woods, with an iron age fort and nature trails. Behind the woods lies the quieter Sand Bay, which true to its name has a pleasant sandy beach backed by sand dunes. An ideal place to relax and unwind. The town also boasts a multi-screen cinema complex and two popular theater venues. The Playhouse Theater & The Blakehay both host professional and amateur productions from concerts, operas and drama plays to colourful children's shows. Weston is easily accessible from the M5 and in a great central location for visiting many of Somerset's popular attractions such as Bath, Cheddar Gorge, Wells and Glastonbury. Steep Holm nature reserve and nearby flat Holm can be reached by boat trip from Weston bay. Steep Holm is a small exposed island with rugged geology and interesting layers off rock strata. The island is a nature reserve and supports a flourishing Cormorant colony that nest up in the 200 foot sheer cliff face on the islands northern side. The larger Flat Holm (covering some 86 acres) contains over twenty historic buildings, many of which are fully restored. There is a Victorian barracks containing an interesting Museum and a pub called the Gull and Leek. On the eastern side is Trinity House fog horn station, which is still in working order. 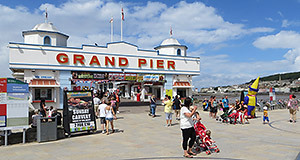 New Grand Pier was originally commissioned in 1904 but totally rebuilt after a fire in 2008. Its award winning facilities include: amusement arcades (with state of the art thrill rides) slot machines and traditional amusements, plus dodgem cars and a full size indoor go-cart track. After enjoying the fun you can relax and enjoy the wonderful sea views from its licensed bar or from the elegant Edwardian style tea room. Facilities: Amusements, rides & attractions, shops, tea rooms, snack bars, ice cream booths, cafe and bar. Traditional Victorian town park, home to Grove house, one of Weston's oldest buildings. 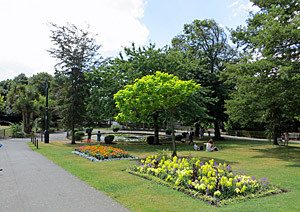 With colourful flower beds, lily pond, palm trees, a children's play area and a traditional Edwardian band stand, where regular concerts are held during the summer. Incorporated into the park is it is one of the towns most popular tractions, 'Jill's Garden'. Created in 2001 by the famous BBC's Ground Force team in memory of the former television presenter, Jill Dando, who was born in Weston in 1961. The garden is a pleasant place to sit and relax, with shaded pergolas and a central water feature. It provides all year round interest with flowering shrubs, grasses, flowers perennials and bulbs. Created in 1920 as a sheltered haven for safe bathing and water activities. Separated from the sea by a walkway, it can be enjoyed even when the tide is out. A very useful facility, as the tide goes out a long long way at Weston, exposing large sticky mud flats. It is claimed, however, that the ozone given off by these mud flats helps to revitalise the air. Used during the 19th-c. as a limestone quarry for local building stone. Now, reclaimed by nature and the local wildlife, it is one of the top wildlife spots in this area. The site is open to the public and is a haven for foxes, buzzards, field mice, badgers, rare birds and wild flowers. The site has a tea room and gift shop, plus many craft/artist studios, including a working blacksmith. Concerts are held in the quarry during the summer months. Classic indoor sea aquarium with displays of lionfish, eels, puffer fish and all types of tropical fish including Piranha. A great all weather family attraction. Facilities: Cafe, gift shop, daily live shows, talks and presentations, wheelchair access. A lovely quite spot, with a two mile long sweeping bay of golden sands, that provide sharp contrast to the busy town area. Ideal for quite walks, picnics, cycling and pony rides. A parking area and cafe is located about half way along the bay and there is also a regular bus service from Weston. The Middle Hope Nature reserve runs along the spine of the bay at Sandy Bay Down. Located at the southern of Weston beach. Uphill is a picturesque little village above which sits an ancient Norman church, surrounded by a nature reserve, which is a great place to explore. The site overlooks a small marina on the estuary and port of Uphill. There is also a salt marsh in a low lying area behind a Victorian sea wall, that supports many rare plant species. Including sea barley, slender hare ear and sea clover. The surrounding hillside and sand dunes are covered with grassland rich meadows that support many rare insects and butterflies. There is an easy access trial, with a good surface but some challenging gradients. Also on the hill-top is a traditional beacon tower. At the top of the tower is the ruin of an old windmill, that may have once been a in 16th-c. watchtower. Children's water adventure play park with water fountains, splash pad, wooden play equipment and safe climbing areas. Facilities: Suitable for children from 1-16 years of age. Learn about the history of this popular seaside resort from prehistory to modern times. Located in the charming old gas works building which was converted into museum in the late seventies. 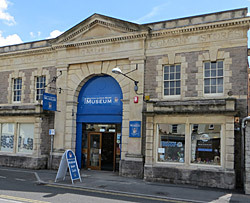 The main aim of the museum is to record and display the history of Weston Super Mare and the surrounding area. You will find interesting exhibits on natural and social history plus a substantial local archaeology gallery, with many exhibits from Worlebury (a nearby Iron Age Fort). The popular Seaside Holiday gallery provides a funny and amusing look into history of the seaside holiday, including a reconstructed 1900s Westonian town house, dentist and chemist store. The central courtyard has been covered over transforming it into a pleasant cafe area. Built in 1926 as a ballroom, the Winter Gardens have since been enlarged to host conferences and exhibitions. To the rear of the building can be found the Italianate gardens with porticoes and pleasant water features. Located on the seafront opposite the pier. Note: The Winter Gardens building is undergoing redevelopment and is not currently open to the public.